Now you see him, now you don’t… and now you see him again! MSNBC mega-pundit Keith Olbermann’s “indefinite” suspension has lasted exactly two days. He’ll be back in the saddle Tuesday evening. I suppose the punishment did fit the crime, which was a minor violation of company policy. It was definitely a publicity coup for the loudly liberal cable news commentator and Bill O’Reilly nemesis. Olbermann, who was in the midst of a four-year, $30 million contract, probably won’t feel the loss of two days’ pay as much as he’ll enjoy the renewed adulation from his progressive-minded fans. Even William Kristol and other rivals on the right leaped to his defense. ← Keith Olbermann: Did He Deserve His Suspension? I signed the petition that went around. And I would never suggest that, say, Rush Limbaugh should be muzzled (though it would be nice if the drug laws will all have to live under applied to him as well). 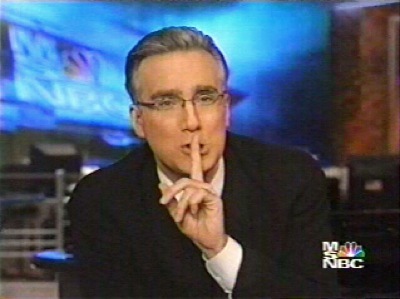 I’m just glad Olbermann’s back. Anyway, I’m glad Olbermann is back, too, even though he’s typically a little over the top in his pronouncements. He’s good at what he does, and the left needs a vocal counterpart to Rush, Glenn, Sean and those other loudmouths on the right. So, they suspended him over the weekend, when he was off anyway. Looks like he got a nice three day weekend over it. I didn’t even know he was gone. Hallie: I have to wonder if a lesser MSNBC employee would have been treated to a mere slap on the wrist (if you can call a long weekend a slap on the wrist) the way Olbermann was. Keith is a valuable property, so his employer needed to tread lightly. I suppose you could test how much you’re valued by organizing betting pools on patient outcomes in your hospital. (16-to-1 against that pancreatic cancer patient in room 205.) That would be good for some national publicity, I bet! LOL… I think that would get me more than a mere 3 day suspension. I’ll save that idea for when I am ready to give up the nursing gig altogether. I don’t know what Olbermann did, but it would seem the MSMBC handling of the affair backfired on them. I mean, if you got the right and left *tsking* your behavior you must of screwed up somewhere. Of course, it did get them some national attention… so maybe it wasn’t such a bad thing.